Before watching this, were I ever to have made a bucket list of a hundred movies I needed to see, this would have been on it (albeit towards the bottom). 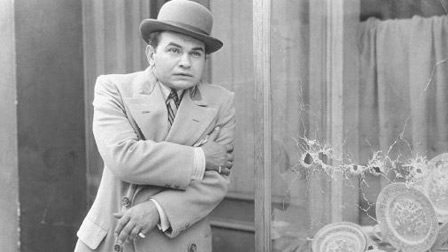 LITTLE CAESAR is a film which has influenced several generations of mob movies. While this isn’t always my favorite genre, my recent love for BOARDWALK EMPIRE has ignited in an interest in that era’s criminal dynamic. Anyway, LITTLE CAESAR showed up on TCM recently, and I snagged it for a viewing. I watched LITTLE CAESAR (1931) on 2.1.13. It was my first viewing of the film. TCM says this is a 1930 film, and IMDB gives a release date of January 1931. I’ll give the credit to IMDB for specificity, but the bigger point is that this arises just off the heels of the end of the silent era. Some of the constructs of silent film can still be found here. There are a few title card type displays. Some of the dialogue-free shots feel overly directed. Yet, despite a few of this sort of incident, this feels like a movie which could have been made in the 1940s. It doesn’t quite sound like one. At least on TCM, there is a fair amount of static picked up by the unsophisticated microphones which hums underneath the dialogue. It is easily enough dismissed by the mind as time goes on, but it is a definitive marker of an early sound era film. Technicality aside, this is the story of a young mobster, the titular Caesar (Edward G. Robinson) scraping his way towards the top of the mafia food chain. The story moves super fast compared to what we are used to today. The beats of trial-and-error are gone, instead we see ‘Rico’ (as Caesar is more commonly known) rising to the top with the greatest of ease. He goes unchallenged in his assent, not facing adversity until he is there. In that way, this is a film which is successful to a modern audience, forgoing some early beats to launch straight into the action. This film comes in before the Hays Code, allowing for some violence and adult situations which would disappear for a few years until the Film Noir era found ways to circumvent the Code. While there aren’t bloody squibs or limbs flying, there is plenty of on screen death. Caesar is ruthless, even if it is a way which doesn’t feel dangerous to a modern audience. This is a landmark performance by Robinson. I know him from his work on DOUBLE INDEMNITY and KEY LARGO. But this is a performance which inspired countless depictions of small men with confidence. The voice sounds cliché to the modern ear in the first scene, but it quickly establishes itself as the most powerful and controlling presence in every scene. There is never any question who runs the show, even before everyone else in the film realizes that he runs the show. Douglas Fairbanks Jr. also appears in this as Rico’s friend Joe. He is the antithesis of Rico. He wants out, wants to be a dancer. Rico calls him a sissy, pushes him to work for him. Joe clearly wants out, but Rico needs that guy he can trust. He is also the only man who doesn’t fear Rico, who is willing to go toe-to-toe with him. The best acting and writing in this film happens when these two square off for the first time. It’s a classic moment of early sound film, right up to Joe’s exit. I’m a little torn on how to consider this film. On the one hand, it clearly stands as a major film of its era and helped launch the contemporaneous popularity of the mobster movie. It offers plenty to enjoy for a modern audience, but the reality is that the development of the mob film far surpasses the simplicity of this movie. I look at it as a relic of its era. It had aged much more gracefully than many of its contemporaries, but there is certainly more to appreciate for film historians than modern film audiences. ~ by johnlink00 on February 2, 2013.